clipped in near the tube cathode. Physically near, but in series with the grid in the drawing, the one other reference I checked was a direct heated circuit and there the battery is in series with a resistance between ground and grid, not in series with signal. I haven't messed with these circuits at all personally. I charged the Dayton 47µF polypropylene film cap (shown below) to 30V and then shorted it with a clip lead for about 30 seconds. After a few hours of recovery I measured it to have "rebounded" to only 8 mV. That was a few days ago. Today its still around 8 mV. Low dielectric absorption and low leakage. That's a D-cell above it. Huge. I have been entertaining comparing the Dayton cross-over cap to an electrolytic for mic preamp phantom blocking. IIRC they're "only" about $10 each. The 47µF electrolytic measured about 1.50 V yesterday. Its acting more and more like a battery. The 47µF electrolytic measures about 1.45 V today. The 47µF film reads 10.6 mV. 1.42 V on the 47µF electrolytic today. At t=114 days we are at 1.27V. Discharge is going to take a very long time. The love of those big, well built, coincidentally low DA, audiophile caps probably isn't completely irrational. Would the magnetic complement to dielectric absorption be core material hysteresis? 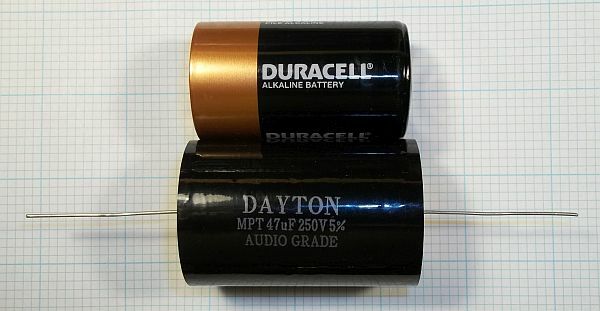 If high levels of filter energy storage element linearity is the goal then why wouldn't air core inductors, with air cores rumored "zero hysteresis", be the audiophile holy grail for eq circuitry? I've played with the spice simulations enough totry and understand a little about the effects of parasitics such as interwinding capacitance, the cost trade off in terms of copper losses, especially for 50.5Hz poles etc. On a somewhat OT side note I've been trying to come up with kind of a floating impedance multiplier circuit to fake a larger inductor from a smaller one using the magic of active circuitry. Kind of like a capacitor multiplier...I could use this for making eq circuits more reasonable size and cost. I have a simulated grounded one working but the floating version is still not there yet...any ideas? I love the whole flat thing but it's so hard to ignore the noise and overload margin enhancement by putting the 2122Hz pole in the 1st stage. An inductor in the "Rg" location, of a classic instrumentation amp architecture, still has an absolute frequency error/channel matching concern from component value tolerance/matching standpoint but completely removes common mode rejection error you get from the more classic alternative method of having this balanced, slightly mismatched pole located in the "Rf" legs instead. ^^^^ oh yeah. Sorry if this is the wrong place for this. This post isn't about dielectric absorption either but it does talk about dissipation factor of bad caps. I have a vintage Pioneer TX-500 tuner that I picked up off the curb more than 10 years ago. I've used it for years as a shop tuner. The AM section had high second-order distortion and it had begun to sound really funky on FM. I felt like soldering today and it needed a re-cap. The date codes of most of the caps were July 1969: 49 years ago this month. Six were United Chemcon, nine were Nichicons. Of the 15 caps I replaced, 12 still measured within tolerance at 100 Hz. A value reading, based on low frequencies, would have shown most caps to be "good." Their 100 Hz Dissipation Factor typically ranged from 0.200 to 1 vs. a modern electrolytic of similar size measuring <<0.04. Based on DF, but not value, all were bad. Using a 1 kHz measurement frequency and declaring caps measuring 1/2 their printed value "bad" the numbers change significantly. 11 of 15 caps were 1/2 their value at 1 kHz. Measurement frequency or LF DF tell a much different story than a simple low frequency value measurement. This may explain years ago after re-capping an MCI JH-500 why we all were stunned at the mid-range improvement after finishing the job. We were expecting a tighter low end, which we got, but the entire console "opened up" post-recap. I think I'm going to throw these caps in a poly bag and FFT them some day. The object was to limit HF gain - I think the -3dB point at max gain was about 80 kHz. We did that to control differential gain since it was going to be used with long (>500 feet) lines. I believe it is pretty much as you described. We have a nice impedance analyzer at work where I can frequncy sweep various parameters . The high ripple current output filter ael caps drying out is essentially what determines our product lifespan. I have been able to catch snapshots at varying stages of caps life and death. I wish I could share the screen shots. The fluid disappears from internal heating from ripple current induced loss and it causes increasing internal Z. As this progression of ever increasing Z goes on, the C vs f curve shows capacitance getting less and less at high frequency. Eventually it works it's way down to DC. Good to know you proved out the inductor in the Rg leg concept. I was a bit worried since I haven't found evidence that many circuits are doing it this way. I wondered why since it has simulated so well for me. I might have to try it. Probably not common because inductors are relatively expensive and could be a vector for magnetic (hum) pickup.